It’s that time of year again the hockey season has now started! No offense to any of our American or International clients, but it is Canada’s game and our staff at Tampo Canada is extremely excited to see the outcome of this season. By now you know that we print on everything from medical supplies, to toys, to golf balls and everything in between. But did you know that Tampo also has the ability to print custom hockey pucks, mini sticks, pads, or any other memorabilia your team or league might need? 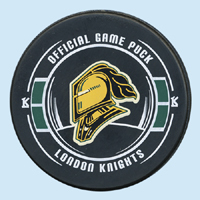 Wouldn’t it be great for the kids in your minor hockey organization to see a hockey puck with custom printing dropped on the face off circle at the beginning of the game? Our technology and expertise can do that for you! No matter what colors or design is needed, we can provide the custom printing you need. If you don’t need pucks, perhaps custom printing for hockey sticks might be what you’re looking for. I’m sure most of you have seen those mini sticks that are given out at NHL games or minor hockey tournaments. The same ones those of us would play hockey with in the arena hallways waiting for our team’s next game. Regardless of your needs when it comes to custom printing for hockey games, tournaments, or leagues Tampo can easily and quickly provide you with exactly what you’re looking for.